A new studio trying to make its mark by flipping an existing genre on its head isn't a scenario that screams success. Nonetheless, 11bit Studios' debut effort is a respectable, if short, experience that is unlike any tower defense game you've ever played. 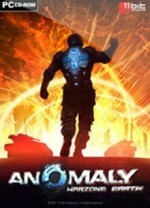 Anomaly: Warzone Earth asks the player to don the power suit of the commander of a small convoy of armored vehicles. Through careful selection of your units and their upgrades and clever application of four game-changing powers, you must lead your force on a slow advance through dozens of urban mazes lined with enemy towers. I never would have thought that a "tower offense" game could be a solid experience, but I was pleasantly surprised throughout this alien invasion. The story is utterly throwaway, but that's not the point. Anomaly is half puzzle and half strategy, with a splash of point-and-click laser beam dodging. Exploiting the six tower types' weaknesses while avoiding their strengths comes in many forms, from careful path plotting to a good unit mix and surgical application of your powers. Smokescreens reduce enemy accuracy while decoys distract them from your real units. Repair fields make up for any sloppiness in your execution. If all else fails, airstrikes can punch a hole in an otherwise impenetrable defense. Each power type is its own pickup, and you have almost no control over what you have access to on any given map. Adapting your strategy to the powers you have available is part of the challenge, though most levels give you a sufficiently balanced set that you can generally do what you like within reason. The six unit types present slightly different capabilities. Unfortunately, a single obvious configuration is the optimal choice for the vast majority of scenarios. An APC up front to absorb the majority of incoming damage, a shield unit behind it to soften the blows, and a couple of cheap rocket artillery trailing to take care of blowing up the enemy is such a solid, cost-effective setup that it takes a highly unusual map to push you into using the tanks, flamethrowers, and supply vehicles. While this does come up a few times during the five-hour campaign, I found myself running out the same crew 80 percent of the time or more. The towers you face come in several flavors, each of which calls for a different approach. The hundreds of layouts Anomaly puts in front of you require creative strategies. Even if I used the same units for most of the game, I had a blast experimenting with different routes and power combinations. Anomaly taunts you with your online ranking on every mission complete screen, which is reason enough for me to dive into optimizing every last detail. The heavily scripted levels don't have a lot of replayability outside of tackling the third difficulty level (easy is a joke for anyone with any strategy experience, while normal is at least a solid challenge in the harder levels). A few large "mayhem" maps that spawn waves of enemy towers should offer a bit more value in terms of chasing high scores, but I suspect that most players will be done with Anomaly inside ten hours nonetheless. Anomaly's short length doesn't make the time I spent with it any less amusing. The chance to explore this well-executed unusual concept is well worth its $10 price tag. I look forward to seeing what the future holds for this talented studio. 11bit Studios' debut effort is a respectable, if short, experience that is unlike any tower defense game you've ever played.